Our partner BCG would like to brought to your attention a great opportunity to discover the full extent of mergers and acquisitions with case based on real BCG project! 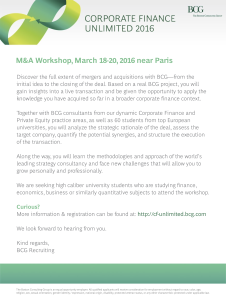 If this strikes your interest, BCG Corporate Finance Unlimited 2016 is just the event for you! More information & registration can be found at http://cf-unlimited.bcg.com or by clicking at the thumbnail of event invite.